We made a beer. Out of burgers. Thrillist's first-ever beer collaboration is here, and thanks to 508 Gastrobrewery's Chris Cuzme (who's some kind of crazy mix of Gandalf and MacGyver when it comes to beer ), it's a bacon cheeseburger beer, aka the "Bacon Cheesebrüger". The making of this amber ale involved smoking that very cheeseburger above (plus many more) into the malt, involving toasted buns into the mash, and other magic that MacGandalf can't share. The best part, though? You could be among the very first people to try it on Tuesday, July 8th at 5pm at 508 Gastrobrewery, where we are unleashing it on the world. 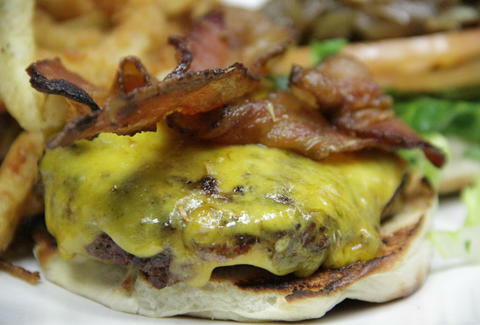 There will be live music, there will be partying, there will be bacon cheeseburger beer. Do it.